Author J. Bowers, whose story “Shooting a Mule” appears in the new Among Animals anthology from Ashland Creek Press, writes with two cat editors. 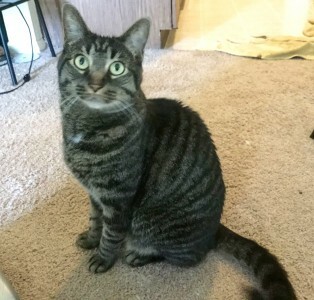 Bama’s mackerel tabby brother, Roland (also named for a Dark Tower character), is helplessly devoted to my husband. But since I tend to write while he’s at work, Ro settles for hanging out with me. I write with a pillow in my lap to cushion my wrists, but he thinks it’s for cushioning him. He will yell at me until I let him jump up, then swat my hands if he thinks I’m doing too much typing and not enough scritching. J. Bowers‘s fiction has appeared in The Indiana Review, StoryQuarterly, Redivider, The Portland Review, and other journals, and she is a contributor to Among Animals 2: The Lives of Animals and Humans in Contemporary Short Fiction. She is an assistant professor of English at Maryville University in St. Louis, MO. Visit her online at www.jbowers.org. 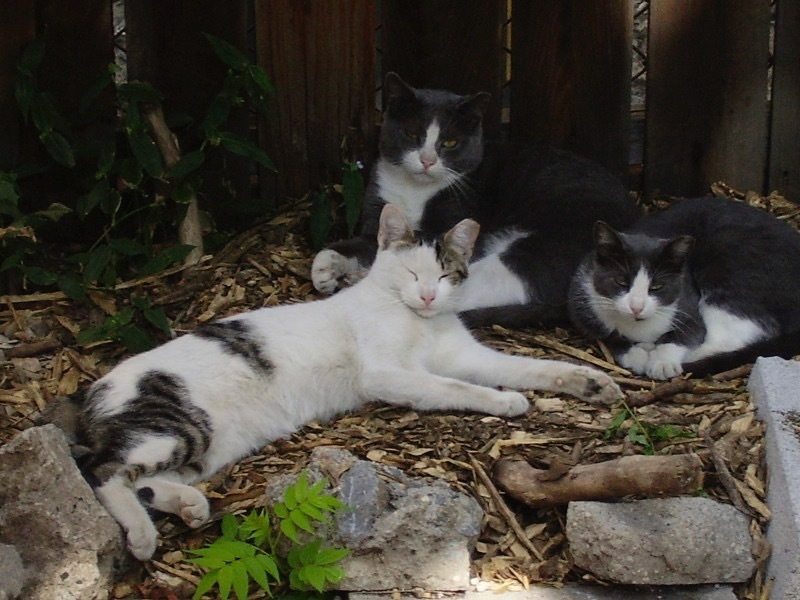 Author Anne Elliott, whose story “Strays” appears in the new Among Animals anthology from Ashland Creek Press, writes with three cats — six if you include the inspiration she has received from ferals in a colony in her Brooklyn neighborhood. Angus is the most senior of the three and wears many hats. 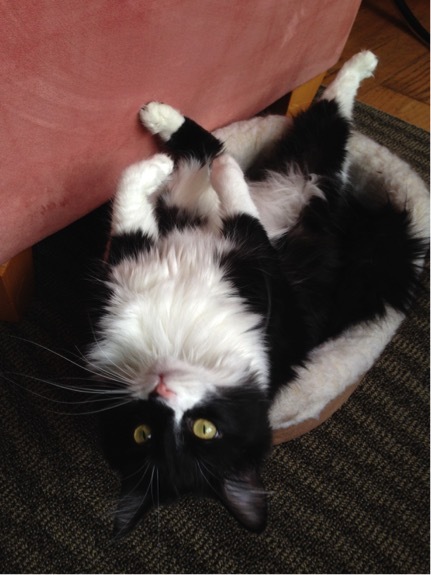 He came from the rough streets of Brooklyn, where he was the feral cat that got picked on. We discovered he liked laps very much, not to mention dogs, other cats, strangers, yarn — there is just about nothing this cat does not like. He had a crushed pelvis when we brought him in, which we did not figure out for at least a year, he was so good at hiding this old injury. But now he is healed, and his self-appointed job is to heal others and keep them company. As for my writing, his job is keeping the other pets from bothering me by bothering them. He is more of an editor-in-chief, managing office politics and getting involved where needed. Ava is the middle one and also came from our backyard feral colony. She was a pregnant kitten when we brought her in. 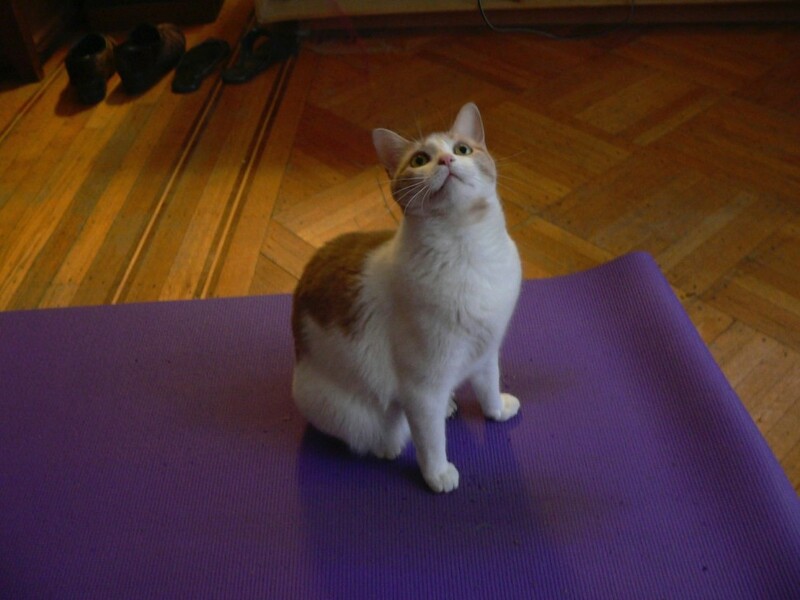 Now she acts as a consultant in my writing program, helping by offering me yoga instruction. I don’t always keep up with her fitness program, but I do find that a little physical exertion helps me to keep my writing flowing. Antonio is a real hands-on junior editor. It’s hard not to get distracted by his blue eyes and constant drooling when he sits on my lap to provide live critique while I compose. 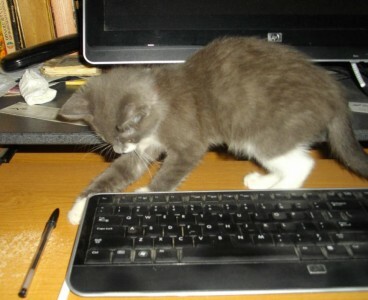 Once he settles down and stops chasing the cursor, work gets done. On the plus side, his comments are always supportive. Occasionally he turns on the computer in my absence and types in edits on his own. He also acts as a teddy bear/dream consultant when I take a nap break. I would be remiss not to include some of my favorite outdoor cats, part of our Brooklyn colony, and all bear the ear-tip mark. As editors, they remind me to be grateful and to let my mind run wild. 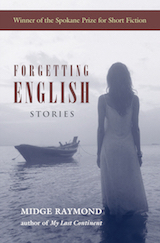 Anne Elliott is the author of The Beginning of the End of the Beginning, released by Ploughshares Solos in 2014. Her stories have also appeared in Crab Orchard Review, Witness, Hobart, Bellevue Literary Review, Fugue, r.kv.r.y, and others. 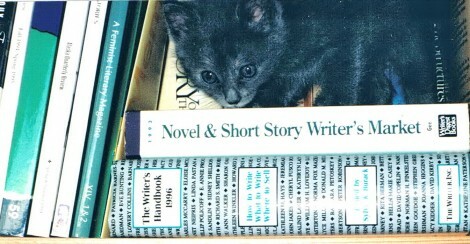 Her story “Strays” appears in Among Animals 2: The Lives of Animals and Humans in Contemporary Short Fiction. 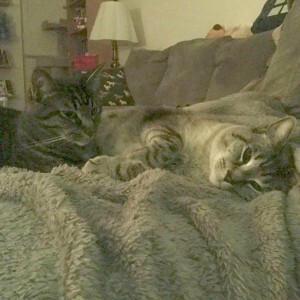 Author Lucy Jane Bledsoe has had several feline assistants during her writing years, all of whom, she says, “fulfilled their duties faithfully and diligently.” Her current two assistants, Scrunch and Parker, have proven to be a bit more challenging. Scrunch, now retired now at 19 years old, relished her job as security guard, keeping the premises free of intruders and investigating each whisper of a sound. So well has the latter performed her duties that she’s become know as Scrunch the Magnificent. So you can imagine my dismay at the behavior of my newest hire, Parker. She doesn’t bathe much, she attacks the elderly Scrunch regularly, and bites me – hard, breaking skin – when I annoy her. She’s also a drain on the full-service healthcare I provide: she’s been treated for a lengthy bout of ringworm, needs regular dental work already at age one, and has litter box habits that suggest digestive tract issues. You might have guessed by now that her time on the job is less than productive. She tears up manuscripts, bats erasers into places where they can’t be retrieved, and, worst of all, chews the wires of all electronic equipment. Sending her back to the wilds from whence she came, because of course she’s feral, has been discussed frequently in our household. Scrunch is all for it. However, we, the two human adults in residence, have fallen in love with her. Yes, we realize it’s become an abusive relationship. We do her bidding, and she torments us. Meanwhile, tending to her whims takes up about 50 percent of my day. I’m getting far too little writing done. Advice is welcome. But we’ll probably ignore it. Lucy Jane Bledsoe’s new novel, A Thin Bright Line, will be published at the end of the year. She’s the author of four other novels, a collection of short fiction, and one of narrative nonfiction, as well as several children’s books. Her recent short story, “Wolf,” won the Saturday Evening Post Fiction Prize. She’s also won a California Arts Council Award and two National Science Foundation Artists Fellowships, which have taken her to Antarctica three times. 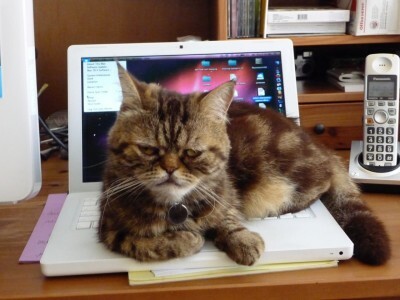 If you’re a writer with a cat editor in your life and you’d like to share the joy, send me a note. 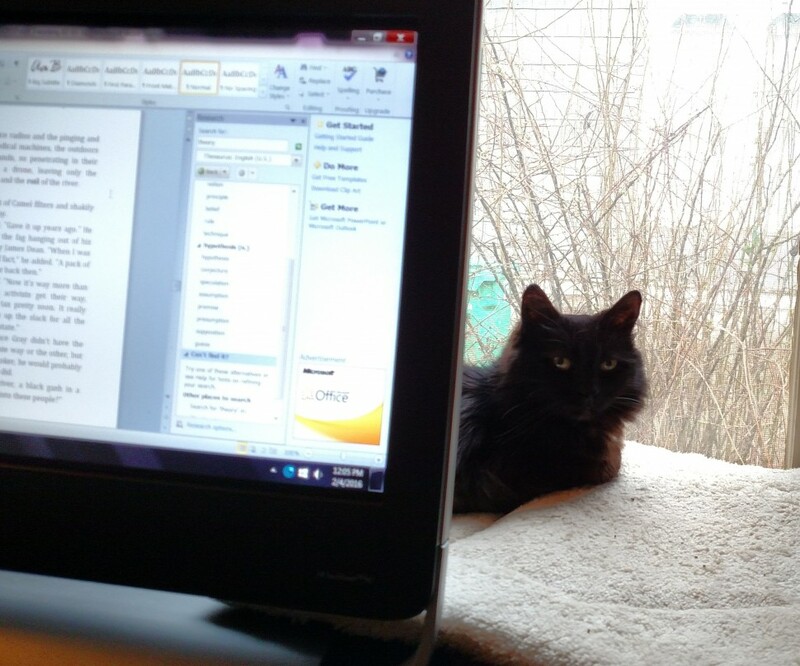 Tinkerbelle, the 14-year-old lady, who up until recently worked as a therapy cat, is my prime editor. From her bed behind my monitor, she guides me with her vast kitty wisdom. Her eyes track inspiration, or is it a bird flitting by outside the window? Little, 9, is more of an hands-on editor. If I become complacent, she brushes her velvet fur across my touchscreen, causing digital havoc. She insists herself into my lap where she purrs encouragement, no matter what I type. 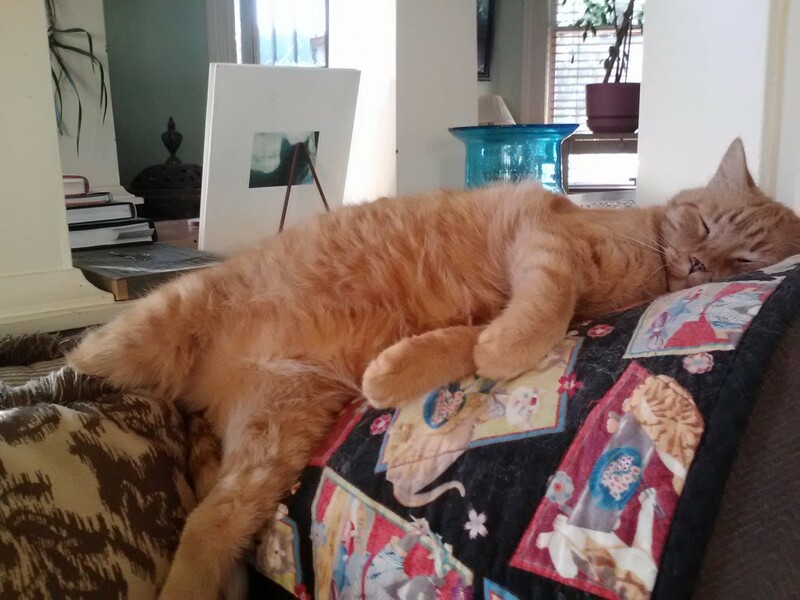 Then there is Big Red. 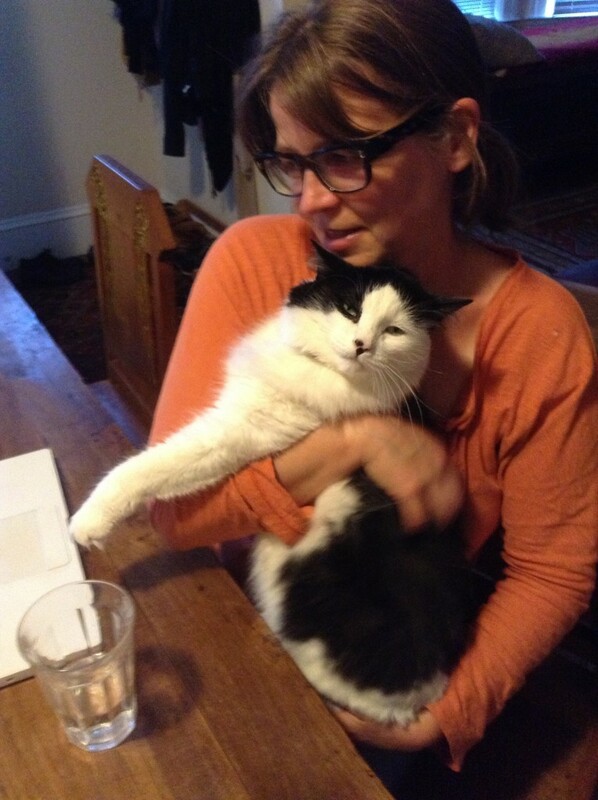 He does not help one bit with the writing, instead drawing me away from my work with sly cat distraction. “Wouldn’t you rather sit with me on the couch?” he mrrows. “Or better yet, fix a little snack for us?” Looking up at me with huge gold-green eyes, I am too easily tempted. 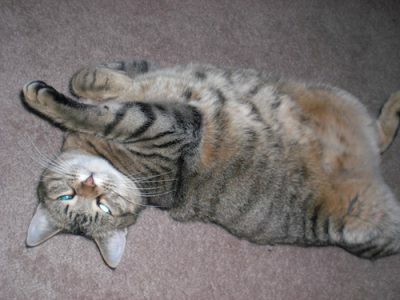 Mollie Hunt has always had an affinity for cats, so it was a short step for her to become a cat writer. She has published two of her Crazy Cat Lady mysteries, Cats’ Eyes and Copy Cats, and the third, Cat’s Paw, will be out in early 2016. She has also written a non-cat mystery, Placid River Runs Deep, which delves into the challenge of Hepatitis C before the “cure. 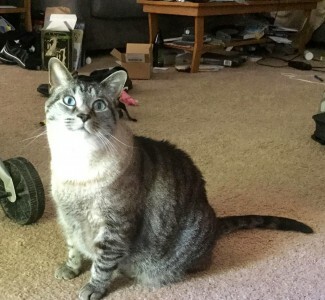 Mollie lives in Portland, Oregon, with her husband and a varying number of cats. Like her character, Lynley Cannon, she is a grateful shelter volunteer. Click here to learn more on Mollie’s blog. Diane Lefer has had many cat editors to collaborate with. Desi was abandoned way too young, only 3 weeks old, and she thought I was her mother. Or maybe the other way around: Like a mother, she was constantly reminding me to get serious and send my work out. When a manuscript came out of the printer, she’d wait for the last page to emerge and then she’d tap the paper for luck. Later, after Desi passed away at 16 years of age, Diane fostered Junie. 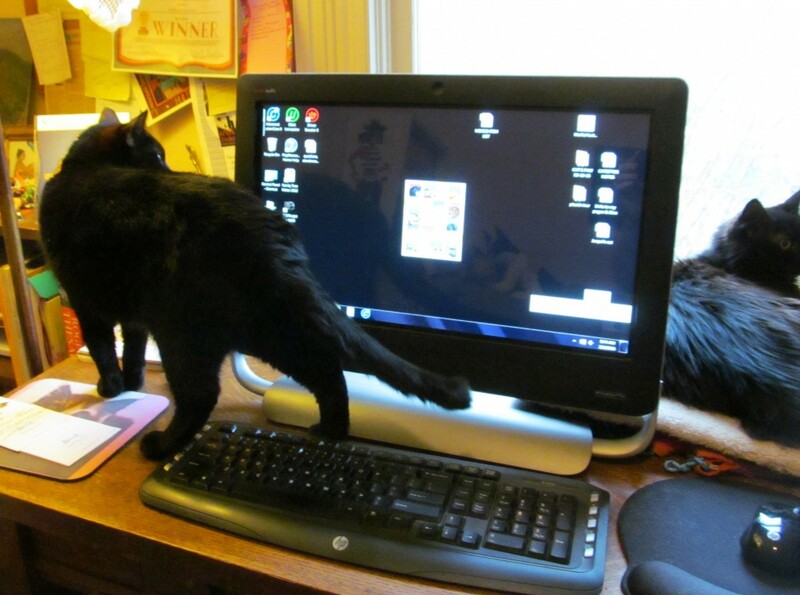 The photos I took of Junie unfortunately also reveal a sloppy work space, something she never held against me. Instead, clutter and books that didn’t stand upright amused her. She was old school, reminding me that sometimes a pen works better than a computer. Now Diane lives and writes with Mildred. She’s very literate. Loves books and fortunately doesn’t literally devour them but she did chew up last year’s tax return. She doesn’t so much edit as perch on the computer and supervise. Diane Lefer is the author of several books, and her work includes fiction, plays, poetry, and essays. Visit Diane’s website to learn more. 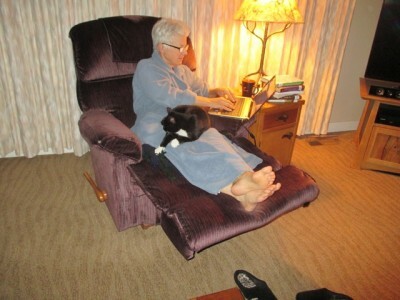 Author Jean Ryan writes with Tango, who obviously does a great job of keeping her author in the chair. Tango does not want me to get too comfortable with my writing. She urges me to stay on the edge, to persevere through difficulty, to remember that the deepest truths are found outside my comfort zone. Jean Ryan is the author of Survival Skills: Stories (Ashland Creek Press, 2013) and a novel, Lost Sister. Visit Jean’s website to learn more, and check out her newest stories: “Lovers and Loners” appears in Four Ties Lit Review, and “Odds and Ends” appears in Crack the Spine. 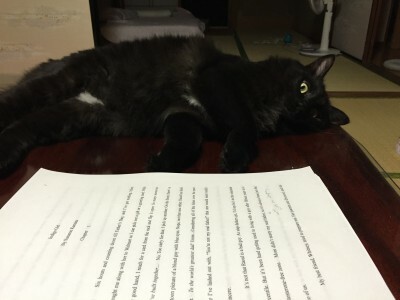 Suzanne Kamata writes with her cat Sumi (which means “ink” in Japanese). Sumi is pictured above with the first draft of Suzanne’s novel-in-progress, a sequel to Gadget Girl: The Art of Being Invisible. Sumi usually sleeps in a chair next to mine as I work at the computer. Here he is, I think, expressing that mix of exhaustion, relief, and joy that comes from reaching the end of a manuscript. Suzanne Kamata’s short stories, essays, articles, and book reviews have appeared in over 100 publications, including Real Simple; Brain, Child; Cicada; and The Japan Times. Her poem “He’s More of a Dog Person” appears in Purrfect Poetry, an international anthology of poems that explore the quirkiness of our relationship with cats. Visit Suzanne’s website to learn more. 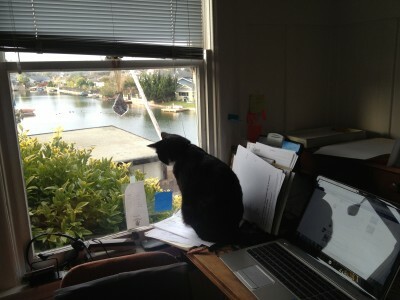 Lori Ostlund‘s two feline boys are watchful and helpful editors. The boys came to us from the Goathouse Refuge, a cat shelter located in the forest outside of Chapel Hill, NC, where we were living for two years while I was the visiting writer at UNC. Prakash, the white boy with pink ears, has kept a careful distance when we work. In the photo below, he can be seen doing what he does: observing as I type. He isn’t supposed to be on the table, but he cuts a fine figure perched there on the corner nonetheless. Oscar, the black-and-white boy, is far more assertive. He walks back and forth across the keys until I pick him up and cuddle him (exhibit 2). He has an amazing ability to step on the keys in such a way that a computer function that I previously had no knowledge of is suddenly revealed to me. Perhaps his greatest contribution occurred as I was reading through the first-pass edits for my novel, which were in PDF. Not knowing that I could make notes on the PDF, I was writing on a pad of paper when Oscar, rushing to attack the pen, stepped on the keyboard in such a way that a PDF Post-it popped onto the screen, thus cutting my editing time in half. 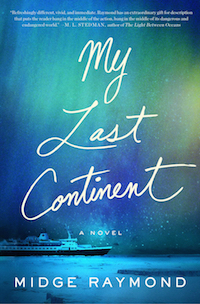 Lori Ostlund is the author of the story collection The Bigness of the World (to be reissued by Scribner in 2016), which won the 2008 Flannery O’Connor Award, the Edmund White Debut Fiction Award, and the 2009 California Book Award for First Fiction. 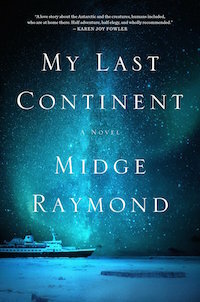 Her novel, After the Parade, was released by Scribner in September of 2015 and is on the shortlist for the Center for Fiction First Novel Prize and is a Barnes and Noble Discover Great New Writers pick. 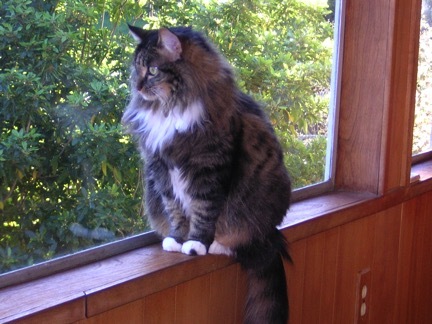 Melissa Clark writes with her fourteen-year-old rescue cat, Percy. 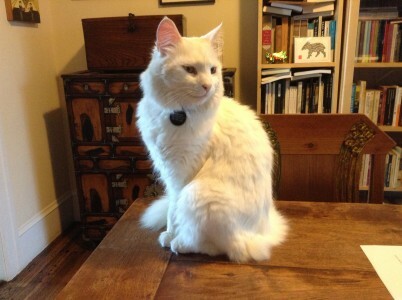 Percy (Persephone) has been with me through three and a half novels, and even inspired novel number two, Imperfect, about a girl who purrs like a cat. She likes to get her paws all over my manuscripts, as you can see. 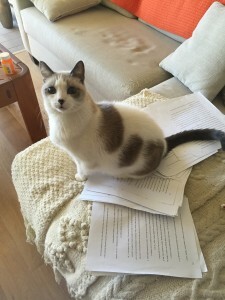 She is a Siamese mix and always has a lot to say, as if my inner-critic isn’t loud enough. Melissa Clark is an author, television writer, and college instructor whose novels include Bear Witness, Swimming Upstream, Slowly, and Imperfect. She is the creator of the animated television series Braceface, starring the voice of Alicia Silverstone, and has written scripts for Rolie Polie Olie, Totally Spies, Sweet Valley High, and others. Learn more by visiting Melissa’s website. True to her calico nature, Camille is a one-person cat. 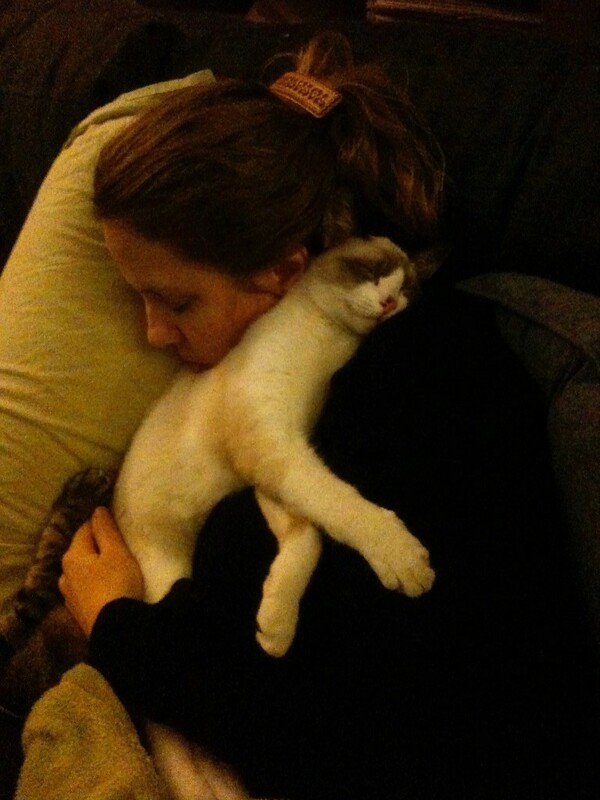 She gets along perfectly well with my husband, but she clings to me. When I write at my standing desk, she’s draped over my feet; if the Mac is propped up in my lap, Camille competes for space on my legs or wends herself around my shoulders to chew on my hair. My 13-pound muse. Julie Christine Johnson is the author of In Another Life, forthcoming from Sourcebooks in February of 2016, and The Crows of Beara, coming from Ashland Creek Press in 2017. 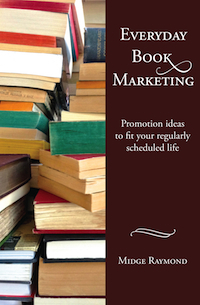 Click here to visit Julie’s website and to stay up-to-date on her forthcoming books! 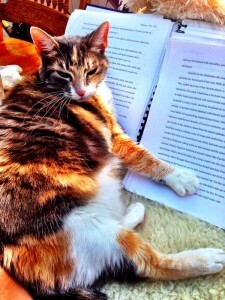 Are you a writer with a cat editor in your life? If you’d like to share your story, send me a note. Julia Park Tracey‘s Ophelia (also known as Fifi, Stinky, Princess, and Pooper) is very hands-on. Lady Ophelia is my Mews. She’s black and white like a newspaper, so her coloring reminds me of my writing work every day. 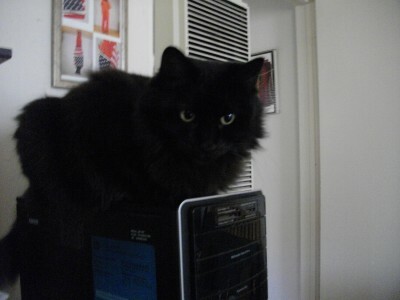 She is chief office assistant, sitting on top of whatever is most important for me right that instant. She also enjoys my lap and the left-hand side of my desk where the to-do list is sitting. Unfortunately, she’s a drooler and occasional biter. She enjoys a bird or cat video, but dog videos annoy her. Open windows are the best kind. A different flavor of cat food every day means I must meet deadlines to make her happy. Julia Park Tracey is the poet laureate of Alameda, California. She is also a journalist and fiction writer. She has written two biographies, I’ve Got Some Lovin’ to Do: The Diaries of a Roaring Twenties Teen and Reaching for the Moon: More Diaries of a Roaring Twenties Teen; a novel, Tongues of Angels; two mysteries, Veronika Layne Gets the Scoop and Veronika Layne Has a Nose for News; and a collection of poetry, Amaryllis. Visit Julia’s website to learn more and to sign up for her newsletter. 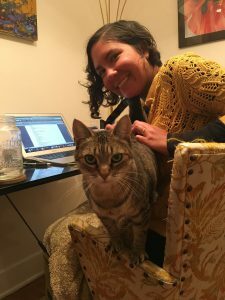 Author Mindy Mejia lives and writes with a cat named Dusty. Dusty’s main editorial talents lie in encouragement and prioritization. 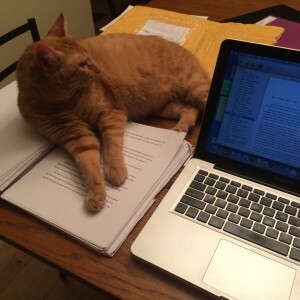 He usually lounges on the table or in my lap, purring his approval at whatever scene I’m working on, and if I start daydreaming he’ll jump directly on top of the computer or manuscript (see picture) as if to say, “Oh, you’ve got better things to do than write? I guess I’ll just make this my new bed.” It never fails to refocus my energy, which I’m sure is his intent. Mindy Mejia is the author of The Dragon Keeper (Ashland Creek Press, 2012) and the novel EVERYTHING YOU WANT ME TO BE, forthcoming from Emily Bestler Books in 2016. Visit Mindy’s website and stay tuned for more news on the release of her new book! Today I’m delighted to introduce you to Judy Reeves and the late, great Rumi. I’ve been told by other editors that I need to get more conflict and tension in my stories, but Rumi really does a “show, don’t tell” by falling asleep on my pages. 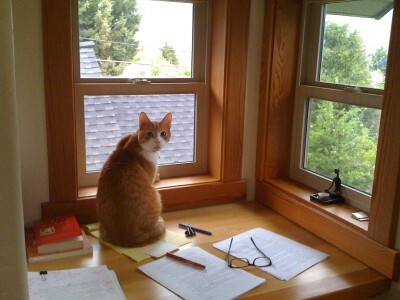 Here’s what he did for me as a writer: reminded me to get up and move away from the computer sometimes. I believe he was telling me that I could get a different perspective if I’d have a little snack, or take just a tiny nap. He also reminded me not to take myself too seriously, and mostly, I think, helped me keep an open heart. Judy Reeves is the author, most recently of Wild Women, Wild Voices: Writing from Your Authentic Wildness. 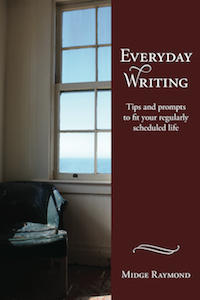 She is also the author of A Writer’s Book of Days; Writing Alone, Writing Together: A Guide for Writers and Writing Groups; and A Creative Writer’s Kit, a fabulous writing kit that includes a 144-page book and a 25-card deck. Visit Judy online, and don’t miss the chance to catch one of her classes or Wild Women events! As any writer knows, writing challenges us in so many ways. 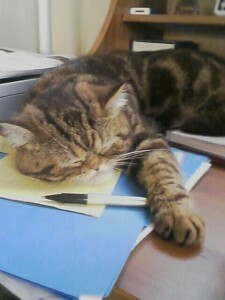 And, as any writer with a cat knows, writing can be even more challenging when our felines try to get in on the action. Which they inevitably do. And there’s no talking them out of it. 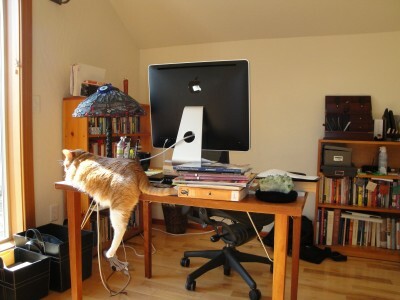 Yet while we may first think that they are getting in the way, these feline editors do, in fact, have something to teach us. Maybe they’re here (on our stuff) to remind us that good creative work requires the occasional break. 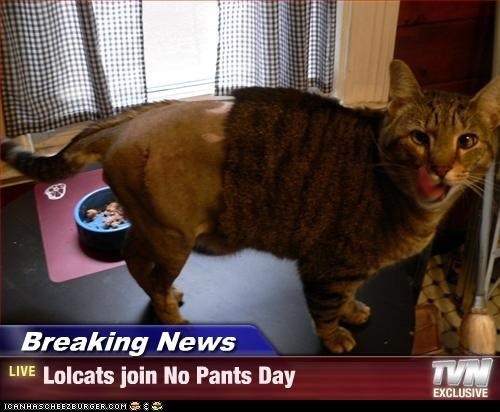 Maybe they curl up in our laps just when we need to stay in the chair. Or maybe they simply make us laugh and remind us not to take our writing lives too seriously. 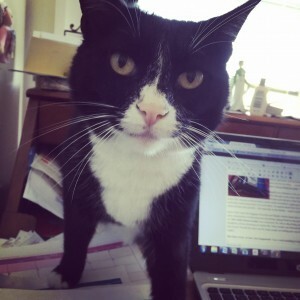 In honor of these dedicated yet unsung heroes (as they would surely put it), I’ve decided to celebrate our cat editors with a blog series. To begin, I’ll introduce Theo. 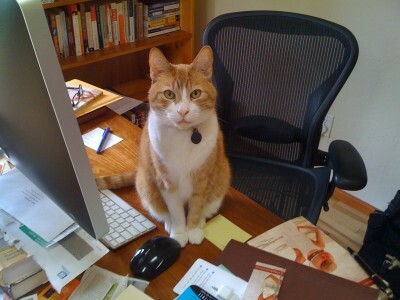 Theo has been on my desk (or my laptop, or my papers, or my lap) for more than 14 years of creative writing. In fact, I can’t think of a single project over these 14 years that hasn’t been overseen (often quite obsessively) by Theo. He can’t seem to resist being near books (and warm computers), and he’ll also steal your pens (which are better than any cat toy we’ve tried to entice him with). 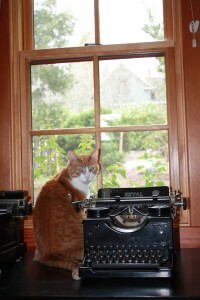 He even likes to hang out among our vintage typewriters. 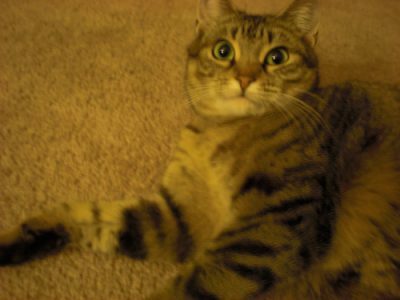 Of course, I’m far from alone in having a feline writing companion, and I look forward to sharing the stories and photos of many other writers and their feline collaborators. 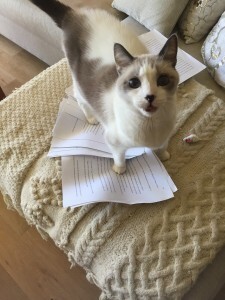 And, if you’re a writer with a cat editor in your life and would like to share your stories and photos, please feel free to send me a note!